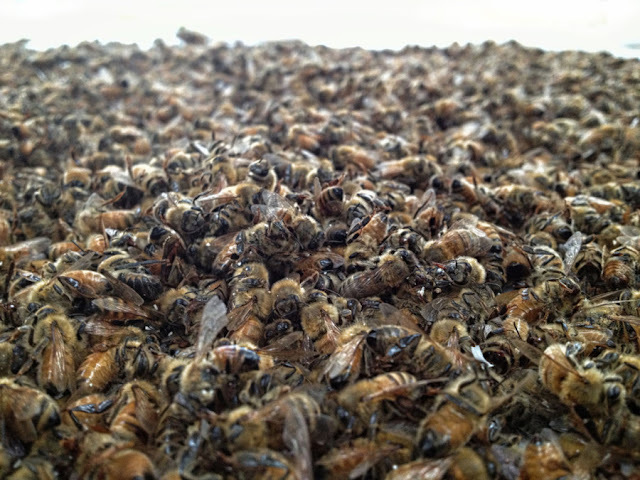 Since 2006 beekeepers have been noticing their honeybee populations have been dying off at increasingly rapid rates. Subsequently researchers have been scrambling to come up with an accurate explanation and an effective strategy to save the bees and in turn save us Homo sapiens from extinction. Extreme weather or climate change will be playing a significant role in the deaths of bees with droughts and extreme cold affecting the bees. A new government study blames a combination of factors for the mysterious and dramatic loss of honeybees, including increased use of pesticides especially in the US, shrinking habitats, multiple viruses, poor nutrition and genetics, and even cell phone towers. However, according to last year’s joint EPA-USDA study, the biggest cause is the parasite called the Varroa destructor, a type of mite found to be highly resistant to the insecticides that US beekeepers have used in attempts to control the mites from inside the beehives. Moreover, new virus species have been found in the US and several of these have been associated with Colony Collapse Disorder. Also on Greenpeace’s Save the Bees page, a type of insecticide called neonicotinoids is known to cause acute and chronic poisoning not just of one bee, but the entire colony. Bees take the contaminated nectar and pollen spread through the plant’s DNA back to the hive, creating a highly toxic living environment for all the bees. Toxicity builds up destroying the Central Nervous System, causing further disorientation and bees ultimately can neither fly nor make it back to the nest. Meanwhile, unlike the US, in Europe and Australia where the health of insects and humans is deemed more important than corporate profit, laws banning insecticide use have been passed, which in large part has largely saved the bee populations from being so decimated there. In February, 2017, more than 10 million bees died in an apiary in the rural area of ​​Porto Ferreira Brazil in less than a week. According to the owner, all the work of almost four decades was lost in the 136 hives due to agrochemicals of sugarcane. In February 2017; Millions of bees die in massive pesticide poisoning in the Region of Murcia, Spain. Greenpeace and beekeepers report that the pollution event occurred when insecticides were applied to fruit trees. January 2017; 10 Million bees dead 'due to pesticides' in Porto Ferreira, Brazil. Your data only goes thru 2008 or 2010. We are in 2017. Bring your information up to date, and I'll take YOU naysayers seriously. In the meantime, I'm not going to doubt God!! He said this would happen.